As part of our Science Week activities we had a best designed lab coat competition. The winners were presented with their prizes at Friday Worship. Proudly wearing our red noses. 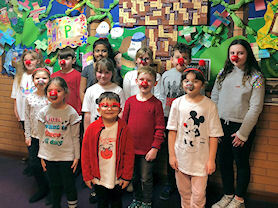 We all had our Red Noses on for Friday 15th March to celebrate Comic Relief. We raised over £200 in school for this great cause. Proudly wearing our new kit. 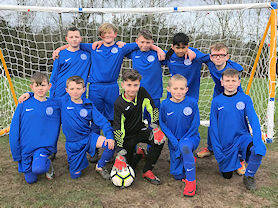 Our football team played against Hamstead Primary in the first round of the Hargate Cup with Hamstead Primary winning 3-2. In what was a very close game, two of our boys scored the goals, while St. Paul's Captain was selected as Man of the Match. The team photo is of the boys wearing our new school kit. Year 3 in their assembly. 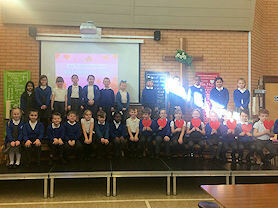 The children in Year 3 led their Class Worship with a St. Valentine's theme. We found out some interesting facts about the heart and all about St. Valentine too! The children sang the Beatles song 'All you need is love'. Well done Year 3! Three runners-up in the Christmas card competition. 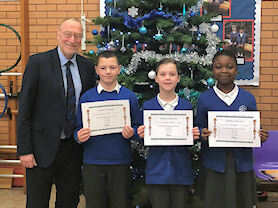 We entered our MP's Christmas Card competition this year and three of our pupils were runners up. The cards will be displayed at Tipton Library. Year 6 presenting their class worship. 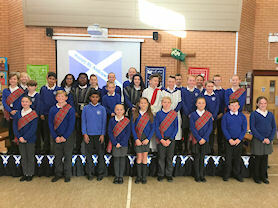 Year 6 celebrated St Andrew’s day with their class worship filled with dance, drama and singing. Displaying some of our work for Black History Month. We have celebrated Black History Month in various ways during October. We have looked at the work of Alma Thomas an expressionist painter and the man who invented the traffic lights; Garrett Morgen. Some classes made freedom quilt patterns and created art work based on Martin Luther King's I have a dream speech. We have looked at influential people from the world of politics, music, and sport in Black History. 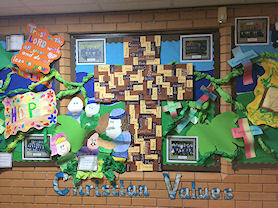 One of our displays on Christian Values. We have been focusing on Christian Values during our Worships this half term. We have displayed some of our work linked to the values. We have raised an amazing £376 for the Macmillan Charity. We had a non uniform day and a cake sale. Thank you so much to everyone who supported this event and to the Parent's Association for organising the coffee morning afterwards. Well done to our Reading Challenge Champion. 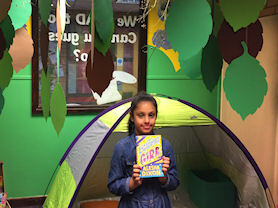 The prize was a copy of Lightning Girl by Alesha Dixon, what a great read! Everyone joining in with National Fitness Day. As part of National Fitness Day many schools were set the challenge of completing ten minutes or exercise at 10.00am. This year, Change4life set a Star Wars themed adventure which involved learning 12 special moves. These moves were then performed as part of a full body routine called 'train like a jedi'. 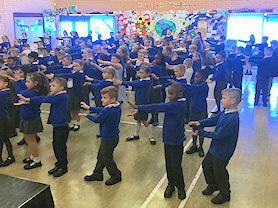 The whole of KS2 participated enthusiastically and completed the challenge successfully, showing a great attitude towards our current PE topic: Health and Fitness. Some of our avid readers. 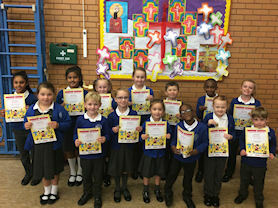 These are just some of the pupils who completed the Summer Reading Challenge! We had lots of children this year who read six books during the summer holidays. Well done to all! Our first Times Table Rock Stars. 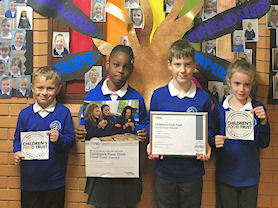 Our very first Times Tables Rock Stars received their certificates today! Keep an eye on the display to see who will be next weeks Rock Star! 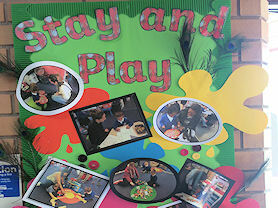 We have Stay and Play in school every Wednesday morning in Reception and Nursery. Parents are more than welcome to join us! 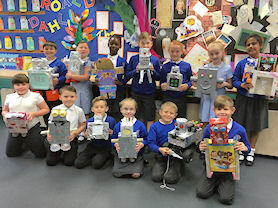 Year 3 showing some of their robots. As part of Year 3's topic work, the children had to design a robot. We were very impressed with some of the robotic creations. Reception's Class Worship in motion. 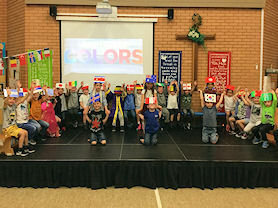 The children in Reception led Worship with a theme all about how good it is to be different. The children sang beautifully and performed a great dance to Colours, which is the World Cup theme song. Well done to our Reception Class, they were great! Proudly showing one of the winning designs. Some of our pupils entered this competition and one of our Year 3 boys did exceptionally well as his entry was one of the top 20 entries chosen by David Walliams out of an amazing 8,000. 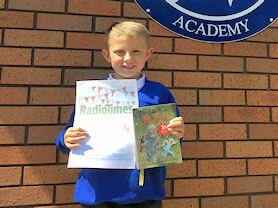 He received a special certificate and a signed copy of David Walliam’s book Mr Stink. You can see his entry in the special Royal Wedding edition of the Radio Times. 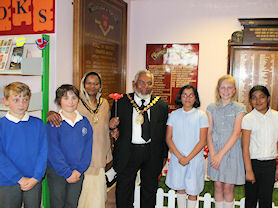 Children with the Mayor at Tipton Library. 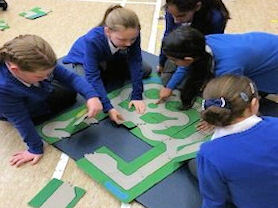 The children in Year 6 were invited to the unveiling of the Mayoral Roll at Tipton Library. Finding eggs with the Easter Bunny. 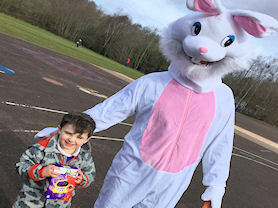 On Friday 23rd March the children in Early Years Foundation Stage and Key Stage 1 met the Easter Bunny as they hunted for Easter eggs. Enjoying lunch with our mums. 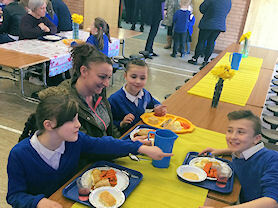 We have loved inviting our Mum’s and Grandma’s in for a Mother’s Day lunch. Thank you to all who shared our special lunches with us. 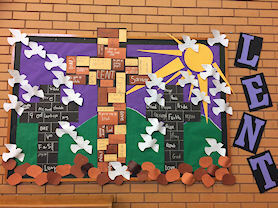 We thought as a school about what Lent means to us all. We have displayed in the school hall some of the things that we are going to give up during Lent and some of the positive things that we might do as well. Year 5 tell us about Saint Valentine. 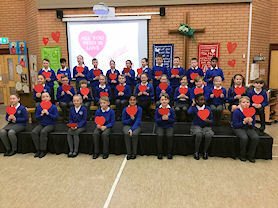 Year 5 led our Worship all about St Valentine. We learnt lots of facts about St Valentine who is actually St Valentine of Rome. The history of Valentine's Day, and the story of its patron saint, is shrouded in mystery. We do know that February has long been celebrated as a month of romance, and that St. Valentine's Day, as we know it today, contains both Christian and ancient Roman tradition. Well done to Year 5. Children receive boxes of games from the Chair of the PA. The Parents Association have worked very hard over the Christmas period raising funds with various events. We decided to spend the money on wet play games for every classroom. The games boxes were officially presented by the Chair of the PA and we have even had some rain so that we could enjoy the games at playtime! 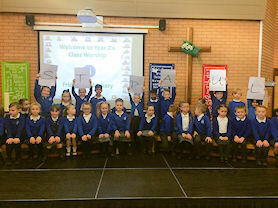 Year 2 spell out 'St Paul'. Year 2 led an excellent Worship on Friday retelling the story of the conversion of Saint Paul. The children all acted out different parts of the story and they shared an acrostic poem that they had written. We were reminded about lots of key facts about the story of Saint Paul. Well done to Year 2! Our youngest children enjoying the story session. Our Early Years pupils enjoyed a story telling session in school this week. We listened carefully to the story of the Bumblebear, which was all about the new bear at school... but of course he wasn't a bear he was a bee! 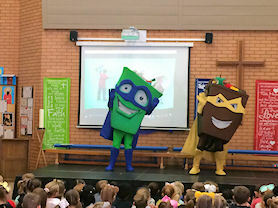 The E-Safety Committee reminding us how to stay SMART. Our E -Safety Committee led a great worship all about how to stay safe online. 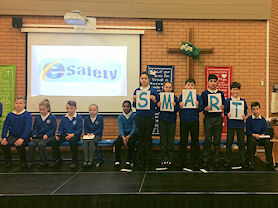 We were reminded of the SMART E- Safety guidelines, and we even watched some top safety tips from staff and pupils. Members of winning Team Fire. Each year group from Years 1 to 6 was involved and divided into four equal teams: Earth, Wind, Water and Fire. Netball and Hockey Fixtures were then played between the teams in every PE lesson for the last two weeks of term. The points from every year group were then totalled to decide an overall winner and announce in assembly. Each year group enjoyed the experience, learning not only new skills but also how to win and lose as a team, portraying good sportsmanship throughout. This tournament also encouraged the children to interact with other pupils from different year groups. At break and lunchtimes individuals were regularly seen asking others how their team had performed in their PE lesson that day. Finally, this years joint winners were team Fire and Wind. However after a tie-breaker this morning, Team Fire were announced as winners. Some of our festive Christmas jumpers. 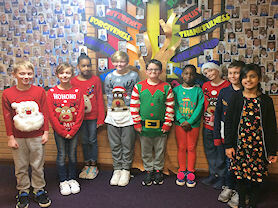 We all enjoyed wearing our Christmas Jumpers at St Paul's. We all joined in the festive fun and raised over £150 for the Crisis at Christmas Charity. Children and parents meet Santa. 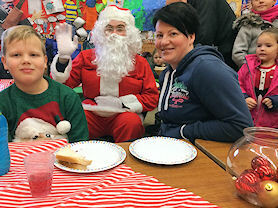 On Monday 18th December we invited parents to join the children for breakfast with a special visitor... Father Christmas! Mr Bailey, MP, and some of the Christmas card entrants. We were visited in school by our MP, Adrian Bailey. 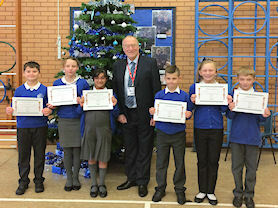 He presented all of the children who had entered the Christmas Card Competition with a certificate. One of our pupils was lucky enough to win the competition and had her winning design printed into the MP's Christmas card. Enjoying the Litterwatch Team assembly. We had a visit from the Litterwatch Team. We were able to share our knowledge about recycling and we were able to share our ideas about becoming more environmentally friendly. 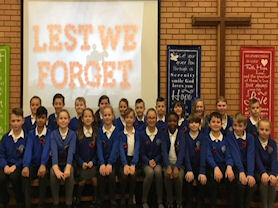 The children in Years 5 and 6 wrote and led our whole school worship on Remembrance. We held a two minutes silence, shared poems and prayers to remember all those impacted by war. 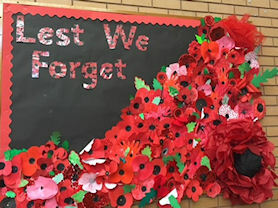 To commemorate Remembrance at St Paul’s all children learnt about the symbol of the poppy and made their own poppy which created our Remembrance display in the hall. We are proud to announce our school has received a national Good Food Award for our commitment to children’s food and nutrition. This has been awarded by the Children’s Food Trust who are the leading experts in children’s food. This means you can be sure the food on your child’s plate is varied and nutritious. We are committed to ensuring every child has the opportunity to eat well at our school. At the National War Arboretum. 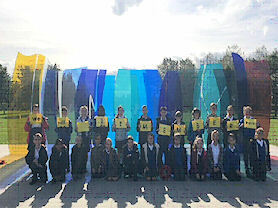 On Thursday 12th October children from Years 5 and 6 visited the National War Arboretum. They visited a range of war memorials from the largest on the site to the smallest. They explored a World War I trench and held their own act of remembrance in front of the Royal Navy memorial. 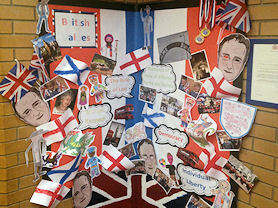 Our display on British Values. We have had a focus on Democracy this term, linked to the election of the School Council. Our School Council election reflects our British electoral system and demonstrates democracy in action: candidates make speeches, pupils consider characteristics important for an elected representative, pupils vote in secret using ballot boxes, etc. Made up of two representatives from each class, the School Council meets regularly to discuss issues raised by the different classes. Ssome of the goodies available on our Coffee Morning. We raised over £300 for the Macmillan Cancer Charity with a coffee morning and non uniform day. Proudly displaying our Safety Mark award. On the very last day of term we were visited by an assessor for the 360 Degree Safe Online Safety Mark. We were very proud to have achieved this with flying colours. 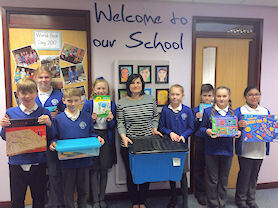 Well done to all involved and especially Mrs Rainford as our Computing lead. 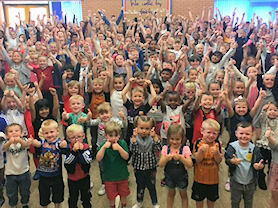 The children pay tribute to Bradley Lowery by showing unity in football kits and giving a big thumbs up to Bradley raising £240 for his foundation. 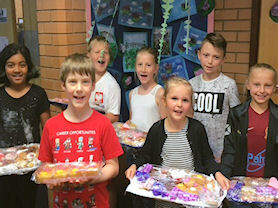 School Council members with some of the cakes. 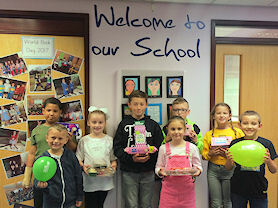 The School Council organised a cake sale to raise money for Acorns Children’s Hospice. They were proud to raise £60. The children on top of Guy's Tower. 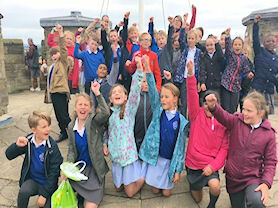 On Wednesday 28th June Year 4 visited Warwick castle. The children were amazed by the birds of prey show, they had the opportunity to explore the sights, smells and sounds of the castle preparing for battle whilst also climbing over 500 steps to reach the top of Guy’s Tower. Children depicting the story of Noah's Ark. 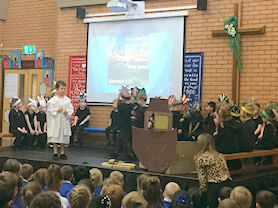 The Reception children shared their own version of Noah’s Ark on Friday 19th May for their class worship. 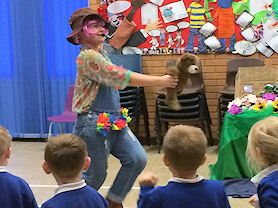 The children had a wonderful time performing various songs, poems, and even a dance, as well as narrating and acting out the story. 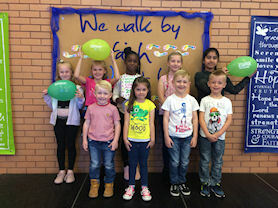 The children put a lot of effort into the worship and put on a brilliant performance. Thank you to parents and friends who joined us to support the children. 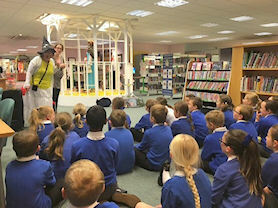 Year 4 at Tipton Library. Year 4 enjoyed a visit to Tipton Library to take part in the retelling of the story of King Arthur. The children dressed in costumes and learnt about the Knights of the Round Table. Year 4 present their story of St George. 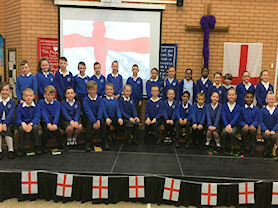 Year 4 lead the whole school worship on Friday 28th April as they share the myth of St George and the true story behind the patron Saint of England. The choir give their Easter performance. 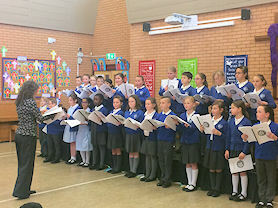 The School Choir have worked hard learning some new Easter songs. They enjoyed performing a selection of them to parents and friends. Proudly showing some of the winning plates. 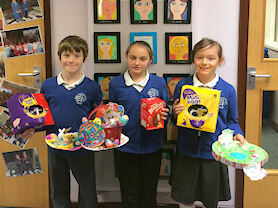 The Parent's Association organised an Easter Plate competition. 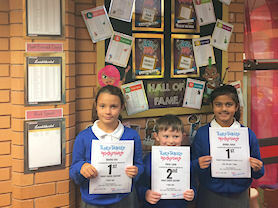 There were three winners from each Key Stage. Here are a selection of some of our fantastic plate designs. Pizza Oven Gets Fired Up in the Forest! 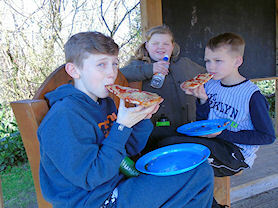 A fresh new challenge in the forest this week as the children make, cook and enjoy their own pizzas cooked using wood they had collected from the forest. Year 6 parents and children participated in a research project for UNICEF – sharing the ways that we raise money in school and different charities we have worked with. 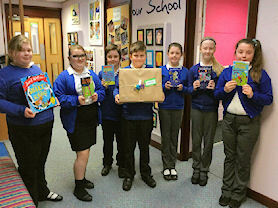 As part of the project the children earnt money for their school which has been spent on brand new home reading books. The children are looking forward to sharing the books with the rest of the Key Stage. Our special dresses for the Queen. Year 1 have begun a new topic called ‘Bright Lights, Big City’. 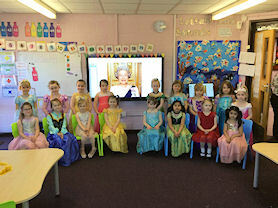 As part of this topic they have been studying Her Majesty The Queen. We got dressed up and used our imagination as though we had a special invitation from the Queen to attend a tea party. We had classical music which we danced to and enjoyed our afternoon tea. Learning about money and finance. 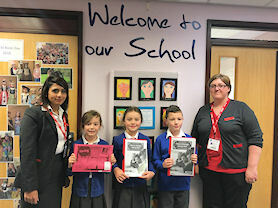 Pupils in Year 4 have been lucky enough to take part in workshop sessions all about money and personal finance led by staff from our local Santander Bank. They all had a great time completing the tasks set whilst learning some very important life skills. They are all looking forward to their next session. Enjoying activities based on books. 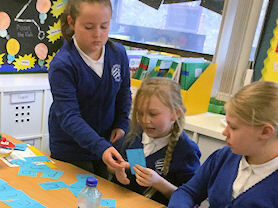 Following a story telling session the children completed activities in their classrooms including Granny’s favourite board game – scrabble – followed by writing an alternative chapter for the novel. Year 6 at the theatre. 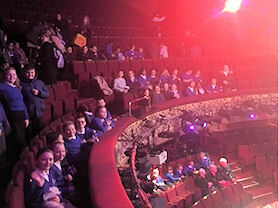 On Friday 13th January Year 6 visited the Wolverhampton Grand Theatre to watch Joe McElderry and Lisa Riley star in a magical performance of Aladdin. "The pantomime was extremely amusing; I would love to come back again!" "This was a hilarious day out!" 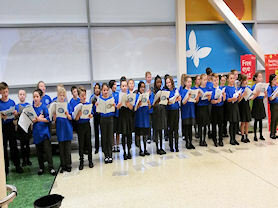 Our fabulous school Choir was invited to sing at Tesco in Dudley. The children had a wonderful time entertaining the Christmas shoppers with their wide range of Festive songs. We also managed to raise some money for school funds too! Big thanks must go to Mrs Kinsella our music teacher for working so hard with us and to the staff who supported our visit. Year 6 performing to the residents. 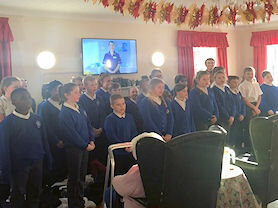 Year 6 walked to their local care home, Matthias House, to sing a selection of their favourite Christmas Carols including: We Wish You a Merry Christmas and In the Bleak Midwinter. Having learnt about Christmas through the ages they also shared a poem entitled Christmas Day on the Somme. 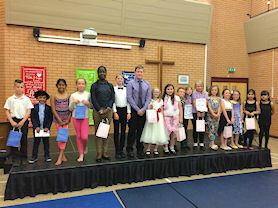 The Parent's Association held the very first St Paul's has got Talent show in school. We were treated to an amazing show with a wide variety of acts including drumming, dancing and even some magic tricks. Our judges managed to choose a first, second and third, however we enjoyed all of the acts and had a great time. Everyone was a winner in our eyes! Painting plates for the Queen's birthday. 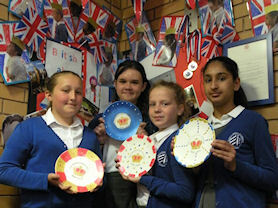 As part of the work that we completed for the Queen’s 90th Birthday, we all had the opportunity to take part in a ceramic plate decorating session. The children then were able to take the plates home to commemorate this very special occasion. All year groups had the chance to experience the fun Happy Puzzle Workshop sessions. Parents were invited to the after school session too! The puzzles and games helped to develop maths and thinking skills, team skills, communication skills, as well as logical thinking skills. We thought it was a fab day; enjoyed by all. 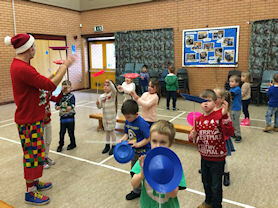 Attendance award winners enjoying their circus skills afternoon. 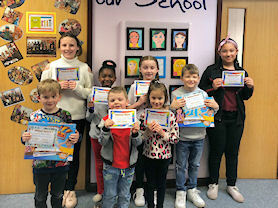 The Attendance Award winners for the Autumn term were treated to a Circus Skills afternoon for their 100% attendance over the term. The children all had a fabulous time. 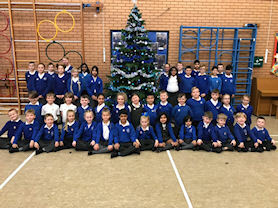 The class with the highest attendance for the Autumn term were Reception, with Year 5 and Year 6 coming a close second. 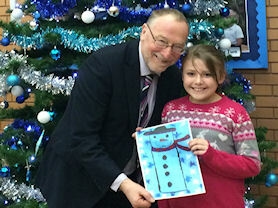 Mr Adrian Bailey, MP, and the Christmas Card competition runner-up. One of our Year 5 girls came runner-up in our MP's annual Christmas card competition. Mr Adrian Bailey MP was kind enough to attend our special Christmas Assembly, where he presented her with a certificate and gift voucher. 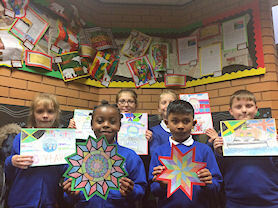 All of the Christmas Card designs will be displayed at Tipton Library over the Christmas holidays. The choir sing festive songs. 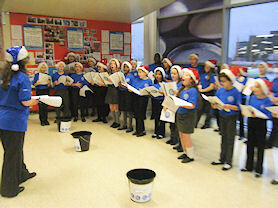 St. Paul's Choir were asked to sing at Tesco in Dudley. The children, with Mrs Kinsella our music teacher, sang a variety of Christmas carols and songs, which everyone enjoyed. The children also raised £180 towards school funds. Everyone had a wonderful time and we can't wait to go back! In London, for a reception with the Prime Minister. 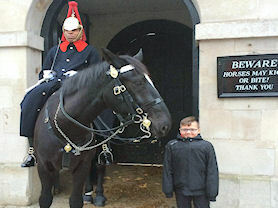 One of our Year 6 boys was lucky enough to be invited to 10 Downing Street on the 10th December 2015 for the switching on of the Christmas Tree lights. He was invited to a reception in 10 Downing Street first where he was able to meet our Prime Minister David Cameron. His mum and Mrs McGuire were invited to attend with him. 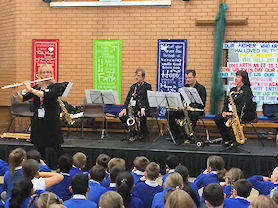 The woodwind musicians entertain the pupils. Key Stage 2 pupils were treated to a wonderful performance from Sandwell Music and Arts Service. The performance included five very talented musicians who played various instruments, this included a bassoon, saxophone, clarinet, an oboe and a flute, and they were accompanied by a pianist. They played many well know pieces including Thriller, Let it Go and Just Dance. We all had an excellent time listening to this. Children with our harvest display. Pupils in school from the Nursery through to Year 6, have all been taking part in Harvest celebrations. The Revd. Allen Bower from St Matthew's Church joined in the celebrations with the pupils, staff and their families on Friday, when our Harvest Festival was held. 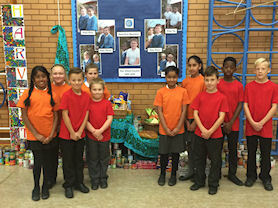 A large harvest food display was donated by families and friends from the school in support of the Well Food bank based in Union Street, Tipton. The Harvest celebrations have been a great success, giving all the pupils an opportunity to share their celebrations of Harvest through music, dance and prayer. 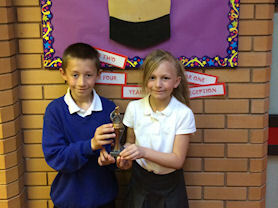 Year 3 representatives with their trophy. 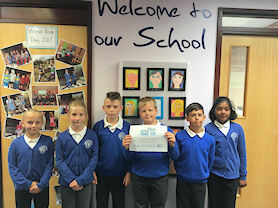 The Tipton cluster of schools held an Attendance Week and St. Paul's came 3rd with 97.8%. The class with the best attendance was Year 3 with 98%. They received a lovely class trophy. 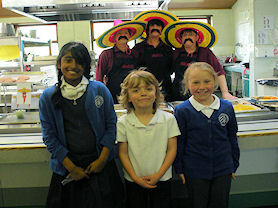 We all enjoyed a Mexican celebration day on the 19th May. Our cooks prepared a feast of Mexican food including tacos, chilli and fajitas... and don't they look great! 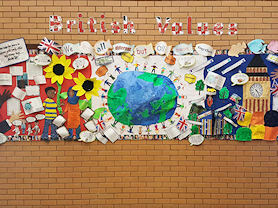 We have completed lots of work on our British values and we have displayed it in school. The children in Reception also completed a fabulous mosaic picture of the Queen. They wrote letters to the Duchess of Cambridge and the Queen and received replies from both of them. Receiving the Inspirational Young Person award. 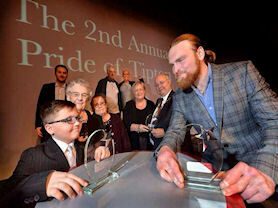 Well done to one of our pupils for winning the Inspirational Young Person category at the Pride of Tipton Awards. Our winner has made a significant contribution to the community with his fundraising efforts. 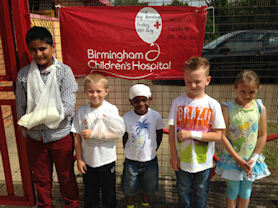 We took part in Birmingham Children's Hospital's Big Bandage Day and raised over £250 for one of our nominated charities. We all had bandages on of different shapes and sizes. How did you wear yours?